Looking for a decent and affordable Virtual Private Network? Well, here is a short overview of one of the best VPNs on the market, and perhaps this can help you make an informed decision. The star of today’s review is SaferVPN, a Virtual Private Network provider founded in 2013 and based in Tel Aviv, Israel. SaferVPN has been considered one of the most reliable, secure and affordable options on the market. And, even though it doesn’t offer a myriad of “useful” features like so many other VPNs, apparently the team behind SaferVPN knows what they are doing—they’re investing in some important things, such as a responsive support desk, optimizing servers and improving the overall quality of service. SaferVPN creates a secret passage for your data that does not allow third parties to catch a glimpse of your internet activity. Additionally, all data that goes through that passage is encrypted, which provides extra privacy. The fact that this VPN service provider is headquartered in Israel has actually proved quite convenient because of the country’s strict laws concerning the privacy of its citizens. According to the country’s online privacy law, the government is quite limited in a legal sense when it comes to monitoring the online behavior of citizens. However, the above should be taken with a grain of salt, for SaferVPN’s policy does imply collection of certain data, namely the date and time when the session began and ended, the amount of data transferred, the end location of the data transfer and the country from where the connection has been established. SaferVPN protects your identity and data with encryption methods preventing third parties from tracking your online activity. The service automatically protects your privacy even when you’re connected to a public WiFi network. Layer 2 Tunnel Protocol (L2TP). IKEv2 is the latest member of the Virtual Private Network protocols family. It provides a high level of security by using the AMS-256 bit encryption protocol. Given the fact that the same protocol is used by the U.S. NSA and other government agencies, experts are convinced that this protocol is top-notch. The protocol also provides high speed, but it’s not supported by all platforms. OpenVPN is somewhat of an oldie but goldie. This protocol uses SSLv3/TLSv1 and OpenSSL library—both encryption methods keep your data safe from third parties. OpenVPN is fast and very secure. However, the setup can be a bit tricky. Regardless of this “flaw,” the protocol is still one of the most popular among users. L2TP uses the AMS-128 bit encryption protocol. It protects all the data that goes through the tunnel. This protocol is characterized as safe and easy to use. The downside is that it can be a bit slow. PPTP provides basic encryption which is one of its flaws, but the good thing is that it allows your connection speed to be higher. This is definitely the fastest VPN protocol, although, unfortunately, it’s also the least secure option. SaferVPN operates by using over 700 servers stationed in 35 different locations across the world, and it also offers more than 2,000 IP addresses. The numbers seem pretty amazing even though this is not the largest network. You can check the full list of available countries here. You won’t, however, find China among the countries covered by SaferVPN servers, since it does not work in China. In order to install SaferVPN, first you have to choose whether you want a month, a year or a two-year plan. Once you select the desired plan, the next step is to select a payment option. SaferVPN supports payments via credit card(s), PayPal or Bitcoin. Specify your platform and operating system (Windows or Mac). Let’s assume you select SaferVPN for Windows. The installation process is quite simple and similar to any other software you download from the web, plus it doesn’t require you to restart your computer. Once the installation process is done, all you have to do is click the Finish button and you are good to go. To start using the service, log in by using the same password and username you used on the SaferVPN website. Unlike some VPNs out there, SaferVPN is considered to offer fewer features. Nevertheless, the overall user experience does not suffer due to this lack of features. On the contrary, one might say it’s not burdened by the multiple confusing options and settings offered by other VPNs. In fact, the user interface has been described as intuitive and easy to navigate, which is certainly still a plus in the software industry. The speed of SaferVPN has been deemed as “… fast… really fast.” The results of a speed test are somewhat different depending on the server location (European locations being the fastest with 79.23 Mbps download speed and 27.78 Mbps upload speed). However, the variations are slight and the overall speed is still very impressive. U.K. servers showed 64.38 Mbps download speed and 39.40 Mbps upload speed; U.S. servers showed 57.47 Mbps download speed and 23.09 upload speed. The situation is significantly different on Asian servers, with 1.28 Mbps download speed and 0.37 Mbps upload speed. The slight drop in upload and download speed (less than 10 percent) is detected when connected to the service, but it does not compromise the entire user experience. Given all the perks and features of SaferVPN, this cannot even be considered a flaw. 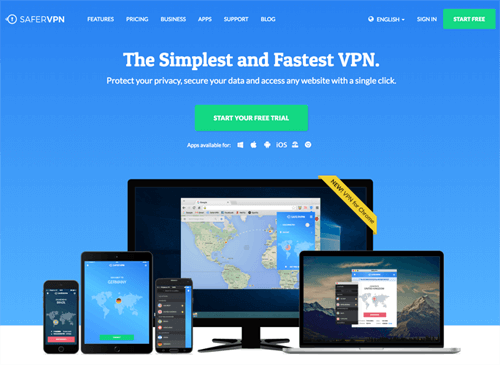 As mentioned above, SaferVPN provides fewer features than most VPN providers. However, the overall experience definitely doesn’t suffer by this. On the contrary, it seems as if the SaferVPN team has invested their time, money and energy into assets that really matter—the quality of their service and optimizing their servers for affordable prices. Some of the main features offered by SaferVPN are listed below. A kill switch that allows you to terminate internet traffic as soon as your internet connection becomes unstable or is lost. This prevents your IP address from being revealed to onlookers. WiFi Security is also a feature specific to SaferVPN. It automatically starts the VPN service whenever you connect to an unsecured WiFi network. There’s a “refer a friend” feature explicitly designed for mobile app users. If a friend who is referred by you installs the app, you both get free service for a month. VPN Router provides secure and private connection for all devices connected to your home network, even smart TV, Play Station console, or Xbox. Clients can use the service on five different devices at the same time. Customer support is another thing SaferVPN is proud of. You can send your questions about potential issues on live chat or via email 24/7. Professional staff will do their best to solve the problem as soon as possible. Customers can also use SaferVPN’s Support Ticket system to report a problem. This method is similar to email but more responsive, which means your issue will probably be solved in a shorter amount of time. Currently, there is no compatible app for Linux. However, SaferVPN can be manually adjusted to this operating system. 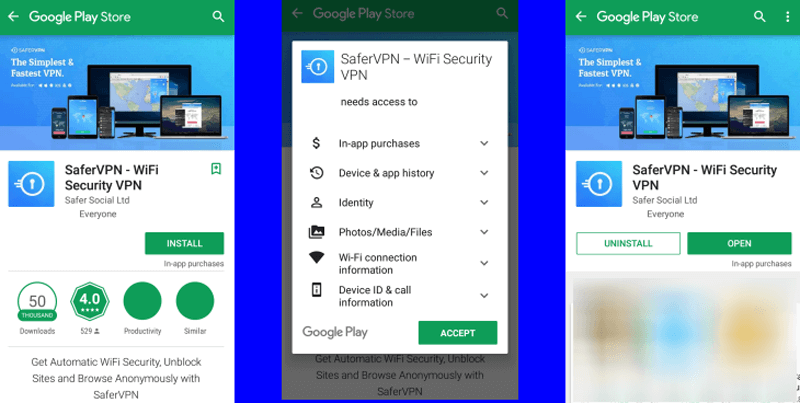 The installation of the SaferVPN app on an Android device does not differ from any other application. Allow access to your WiFi information, device history, identity, etc. When the installation is completed, you can open the app and login with the same credentials you use for the desktop version of SaferVPN. After the installation, you will be able to use a seven-day trial version for free. The mobile app also uses 256-bit encryption, and you are automatically protected when connected to a public network. The app does not log users’ online activity, and IP addresses are always hidden. The app also features a kill switch, and a very welcome point is that it does not contain annoying ads. SaferVPN definitely provides solid online security and anonymity for a price that’s more than reasonable. For a one-year plan, users have to pay $4.99 a month. A two-year plan is currently on discount, and it costs only $3.49 per month. However, even though this is the most affordable option, it does impose a two-year commitment, as noted by users. SaferVPN features a free Chrome extension, a kill switch setting and automatic WiFi security while connected to public WiFi networks. On the other hand, it doesn’t work in China (one country that could easily account for half of their user base), and you can download torrents only through the Netherlands server, which are both rather unpleasant surprises and considered as cons by many users of Virtual Private Network services.